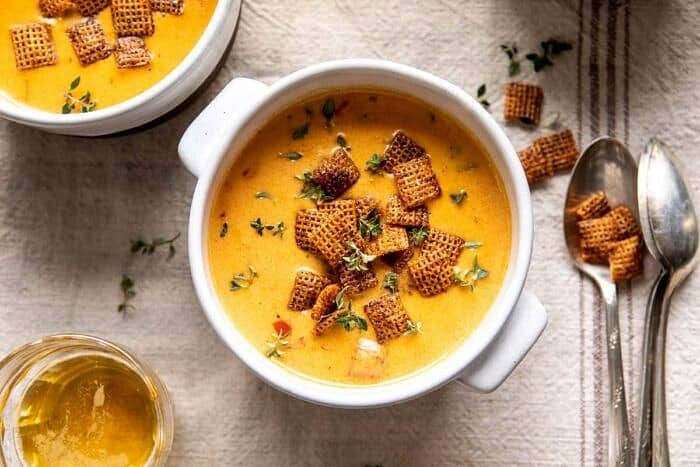 Beer Cheese Soup with Chili Spiced Chex. 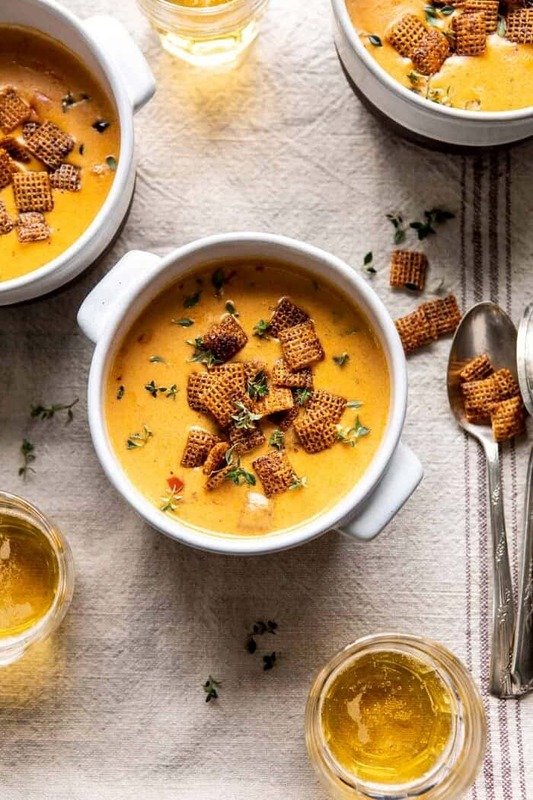 This Beer Cheese Soup with Chili Spiced Chex™ is a mix of peppers, beer, and two cheeses. It’s a little spicy, a touch smoky, and so cheesy. 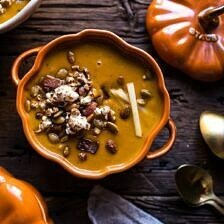 Top each bowl off with homemade chili spiced Chex mix and you’ll have the perfect bowl of warming soup. Great for winter nights or watching this year’s Big Game. This post is sponsored by Chex Cereal. Freezing cold winter days call for soup. 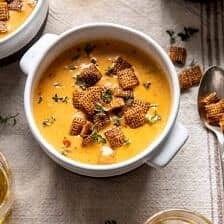 Preferably this cheesy soup, topped with the most delicious and addicting chili spiced Chex. This recipe may not align perfectly with our healthy January eats, but I just had to share it. It’s the best warming soup to serve up when coming in from out in the cold. It would also be an excellent choice to serve on Game Day ! 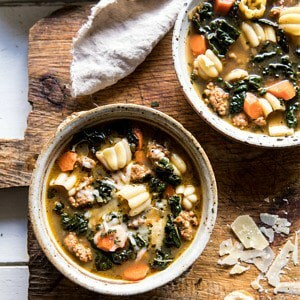 There’s really nothing I love more during these bitter cold days than warming up with a bowl of soup. We’ve been having some seriously cold temperatures here in Colorado, so I love spending a little time on a Saturday or Sunday making soup. Perfect cold weather activity. The base of this soup contains a mix of 3 peppers, beer, and cheese. I really wanted to flavor the soup with a nice balance. It’s still indulgent, but hey, we have some veggies in here, too! To start, cook up a mix of shallots, jalapeño, poblano, and bell peppers in a little olive oil. I like to get the veggies caramelized before adding in any liquid. Once the veggies have begun to take on some color, add flour and then pour in some milk, beer, and broth. For the beer, I prefer to use a wheat, but honestly anything you drink at home will be just great. Now, the cheeses. I love using a mix of sharp cheddar and smoky gouda. Both of these cheese melt really well. They also give the soup a great flavor that pairs nicely with the heat from the peppers. Add some smoky paprika for a touch more flavor, and fresh thyme for a little herb action. And that’s it…simple, but it’s one of those soups that will leave you scraping the bowl clean. 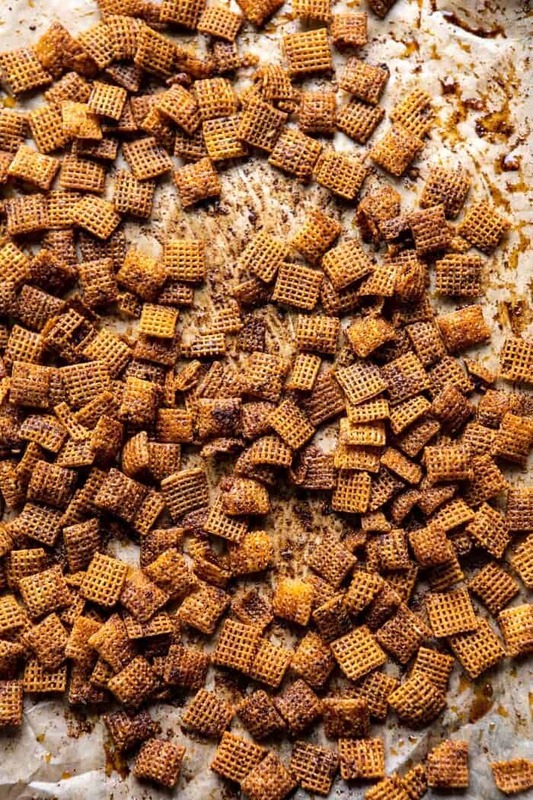 While the soup simmers away, make the chili spiced Chex. Here’s the deal. I know that this is a rather unusual topping, but don’t skip it. It’s one of the best parts to this recipe. And let’s be real, every bowl of soup needs something carby to go along with it. Mix the Corn and Rice Chex with melted butter, chili powder, and chipotle chili powder. 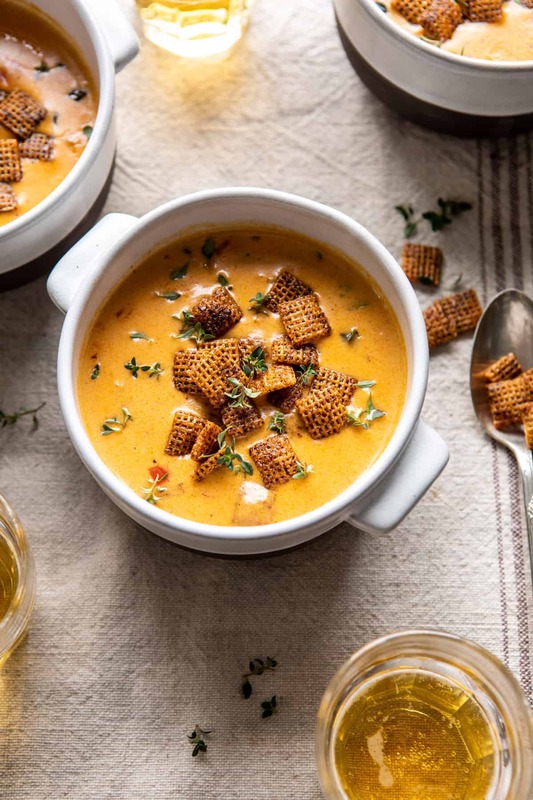 Bake until crisp, then top off each bowl of soup with the Chili Spiced Chex Party Mix. 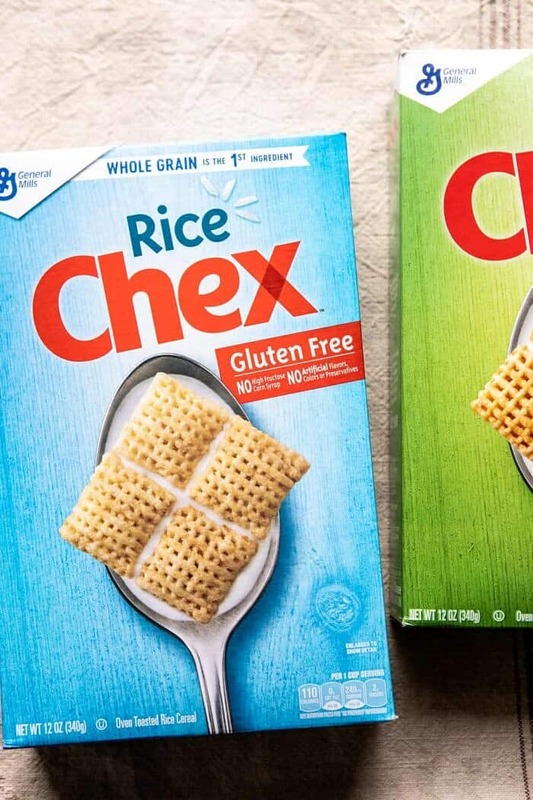 The perfectly seasoned Chex adds a really nice crunch to each spoonful. I’m loving the idea of making this for the Big Game, but in reality it’s easy enough for any day of the week! 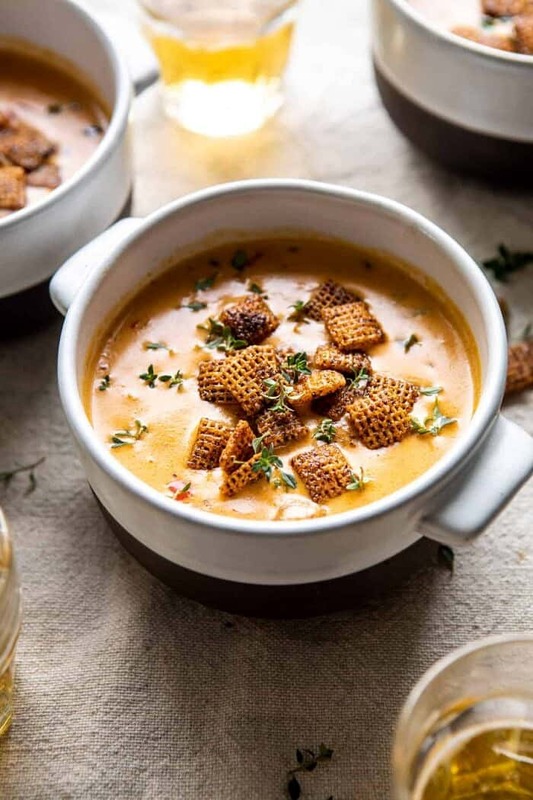 If you make this beer cheese soup, be sure to leave a comment and/or give this recipe a rating! Above all, I love to hear from you guys and always do my best to respond to each and every comment. And of course, if you do make this recipe, don’t forget to also tag me on Instagram! Looking through the photos of recipes you all have made is my favorite! This soup is a mix of peppers, beer, and two cheeses. It's a little spicy, a touch smoky, and so cheesy. 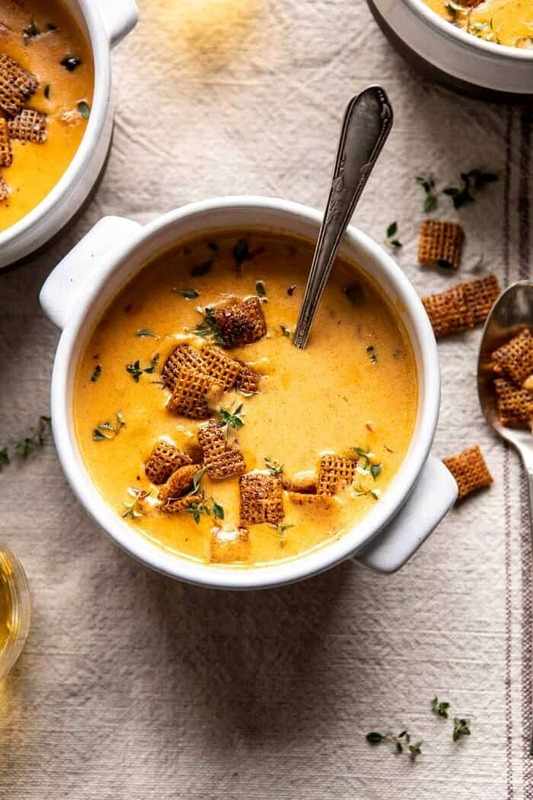 Top each bowl off with chili spiced Chex mix and you'll have the perfect bowl of warming soup! 1. Heat the olive oil and butter in a large pot over medium heat. When the oil shimmers, add the shallot, jalapeño, poblano pepper, and bell pepper, and cook 5 minutes, until fragrant. Stir in the flour and cook until golden, about 2 minutes, then gradually whisk in the milk until smooth. Add the broth, beer, paprika, thyme, and a large pinch each of salt and pepper. Bring to a simmer, reduce the heat to medium and cook, uncovered, until thickened slightly, about 10 minutes. 2. Stir in the cheese until melted and creamy. Taste and adjust seasonings as desired. 3. To make the Chex Party Mix. Preheat the oven to 300 degrees. 4. On a rimmed baking sheet lined with parchment paper, combine the Chex, butter, chili powder, chipotle chili powder, and a pinch of salt. Transfer to the oven and bake 20 minutes, toss and bake another 20 minutes, or until the Chex is toasted. For some reason the photos didn’t come through on my end. But the recipe sounds amazing and will go on my list of recipes to try. I love the spiced Chex idea as a topping – way more sophisticated than crumbled crackers, hehe. Your photos did not come through on this post but your recipe sounds delicious. I bought your cookbook before the holidays and loved it. I made your meatball recipe and it was a hit. This looks amazing. I going to make it gluten-free and serve it on SuperBowl Sunday! Thank you. Sounds amazing for SuperBowl Sunday!! I hope everyone loves this Michelle! This looks so pretty. 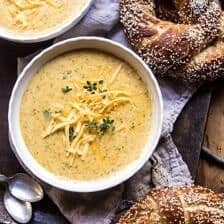 My husband loves beer cheese soup but I’ve never had it, and have never attempted to make it either. This will be great for our cold weather here in Wisconsin, or for a Super Bowl treat. Yes! I hope you both love this recipe, Sarah! SO glad you finally posted this!! Can’t wait to try it!! Thank you Nancy! I hope you love this! This was delicious thank you! I’ve been looking for a good beer cheese soup recipe for years. I made this with popcorn instead of Chex Mix because that’s what I like on my beer cheese soup. I just mixed the chili spice and the chipotle with the salt I put on the popcorn. Thank you so much Rebekah! I am so glad you loved this! if food is doesn’t look special, its test doesn’t win your mind. food should always look charming then test. your recipe is looking awesome and I,m sure its test will be awesome. you make it very special. Def making for Super Bowl Sunday! Question though, I’ll need to make ahead and transport. Does this reheat without thickening too much? If so, are there adjustments I can make to offset? Thank you! Do you have a recommendation for a certain type of beer for the recipe (IPA, wheat beer, etc), or does it not matter too much? This looks amazing! I have childhood memories of beer cheese soup and was just thinking about it recently. It doesn’t look like it’s really needed here and could just be left out but I really dislike thyme so I was wondering if you might have a suggestion for a good alternative in recipes that need it? I completely ruined a lobster bisque thinking I wouldn’t notice it as a small part of a recipe. Thanks for any help! This looks amazing – can’t wait to try it. I would even consider making a bacon jam sandwich to dip in the soup – a twist on one of my favorites – grilled cheese and bacon jam sandwich. Thank you Bill! I hope you love this! 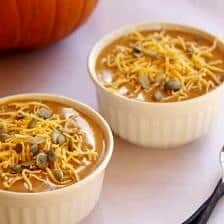 Excellent soup, great anytime and really easy to make. Thank you so much Darel! I am so glad you liked this! I wasn’t sure I’d need 2 cups of Chex mix, but I’m so glad I made the full batch. I made the Chex mix a few hours before the soup, and couldn’t stop snacking on it. That part alone is worth this recipe! The soup was very good as well. Thank you for another great recipe. This soup is so spectacular I could cry! Easy to make and fabulous! I used Guinness in mine and I really loved the flavor.